In this article we will try to break down the best guitar pickup types, shedding information and giving light to those searching and looking for the best pickup that would suit their playing style. Fishman is dedicated to helping musicians achieve the truest sound possible whenever they plug in. Equipped with cutting-edge neodymium magnets, the new Rare Earth pickups offer a warmer, more naturally acoustic tone, along with exceptional accuracy and increased musicality. Rare Earth Active Sound-hole Pickup uses miniature batteries mount conveniently on the underside of the pickup and has a low-current design of the preamp that allows up to 240 hours between battery changes. The newly designed plug-and-play, mounting system easy to install, right out of the box without altering your guitar, features ergonomic body shape, and a pre-wired output jack that can also be endpin-mounted. Equipped with innovative neodymium magnets, the new Rare Earth pickups offer a warmer, more natural acoustic tone, along with exceptional accuracy and increased musicality. The easily mounted Woody HC is a hum canceling, passive, noiseless, magnetic sound-hole, that delivers a warm, rich acoustic tone great for many acoustic playing. Its hum-cancelling design delivers a fatter, more compressed sound than the SC (single coil) version. All the Woodys are available in custom maple, walnut or black stained housing, and are double potted to keep them resistant to feedback. 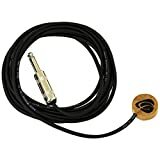 It mounts instantly into your sound-hole, with no modification of any kind needed to it can easily remove the guitar at a moment’s notice and comes with a 14-foot low capacitance, studio quality cable that will plug directly into your favorite amp, PA, direct box, or console. The Seymour Duncan Woody fits all standard sound-holes (3.75 (94mm) to 4.0 (100mm). Great for all standard types of steel string acoustic guitars. This is a magnetic pickup, and will not work with nylon stringed instruments. 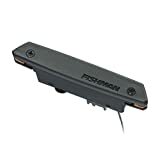 Fishman’s Matrix Series Pickup Systems is the world’s number one selling under-saddle acoustic pickup and is the standard for under-saddle acoustic pickup by which all others are judged. The Matrix Infinity pickup and preamp system is the newest version of Fishman’s flagship Matrix Series. 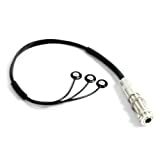 It offers a clear, transparent tone, dynamic string response, and ease of installation. Easily accessible sound-hole-mounted volume and tone rotary controls allow the player to effortlessly make adjustments to their sound, and has a completely redesigned active, endpin-mounted preamp. High Output - No Battery Required! The Pure Mini is an award-winning, signature pickup for steel string acoustic guitars from K&K Sound, with a 3-head, bridge plate transducer. It features super balanced, flat sound transmission, warm woody tone with no quack and superior dynamic range all over the guitar’s frequency spectrum. Bridge plate transducers are the optimal choice for achieving a rich, natural guitar sound. The Pure’s position on the bridge plate provides the perfect balance of sound, picking up all the strings without sounding harsh or percussive and “listening” to the soundboard to amplify the unique characteristics of your guitar. The result is a warm, full-range signal that sounds great even without a preamp. The Mini’s output is louder than any other passive pickup on the market. Great for guitar violin cello stand up bass banjo mandolin piano horn or anything which vibrates. Artist Transducer’s special mounting adhesive allows the Artist to be mounted and removed many, many times without hurting the finish. Easy to take on and off and is safe on your instrument. A Worldwide Best Seller since 1980 by Dean Markley, this patented design uses a lead differential weight that reacts through compression rather than just bending, that provides a professional and studio quality sound. We will start with the most commonly used electric guitar pickups – the sound-hole pickup. This pick up is like an electric guitar pickup, which is essentially a magnetic pickup with six different pole pieces that line up with the strings. 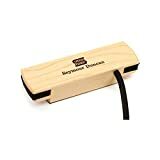 As its name implies, a sound-hole pickup sits in the sound hole of the guitar and its magnet picks up the sound of the guitar from the string vibration. These pickups are fantastic if you use effects, and can handle distortion or reverb effect, or anything that alters the signal of the guitar. Sound-hole pickups are feedback resistant because they are not picking up body vibrations, just string vibration, and makes them less susceptible to feedbacks. They can be permanently installed just like a standard pickup that runs inside the guitar. An under saddle pickup is a thin piezo crystal element that sits underneath the saddle of your guitar. These pickups are clear and articulate because of where they’re picking up the vibrations, under the saddle that gives them a clear stringy sound. Under-saddle pickups are oftentimes in an active configuration, giving a boosted signal and carrying a quick access volume and tone control onboard the guitar. The last pickups are the minimal invasive pickups called contact pickups. Contact pickups have two kinds, the bridge plate transducer pickup. A three sensors that sits on the bridge plate of the guitar. They pick up vibrations across a larger area, an acoustically rich area that makes it transparent and true to its acoustic sound. 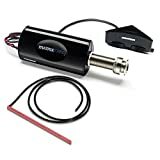 There is a wide range of discussion for the pickup you would encounter when choosing and shopping, for one. It is important to consider the musical style you’re playing, whether playing in a band where the instruments are loud and you need to increase your volume level to be heard, and so this calls for a sound hole pickup which is less prone to feedback, or if you want the clarity of the under-saddle pickup, or transparency of a contact pick up. All these are things to consider and acknowledge when searching for the right guitar pick up. It’s not about having the ultimate pick up, but it’s knowing there’s a wide range of pickups available out there, and choosing the right one that best suits you.